The Ohio Regional Business Aviation Association (ORBAA) represents our membership in matters impacting the interests of Business Aviation in Ohio. HR 2997, which is the House version of the FAA Reauthorization, includes a proposal to reform how Air Traffic Control (ATC) is managed. ORBAA intends to follow this legislation and process the most relevant and accurate information from all sources before reaching a conclusive position and recommendation for our members. Regardless, the end goal for everyone throughout the industry should be to support an ATC system that seeks to modernize to the best technology available, while maintaining the highest achievable safety, reliability, and system access. 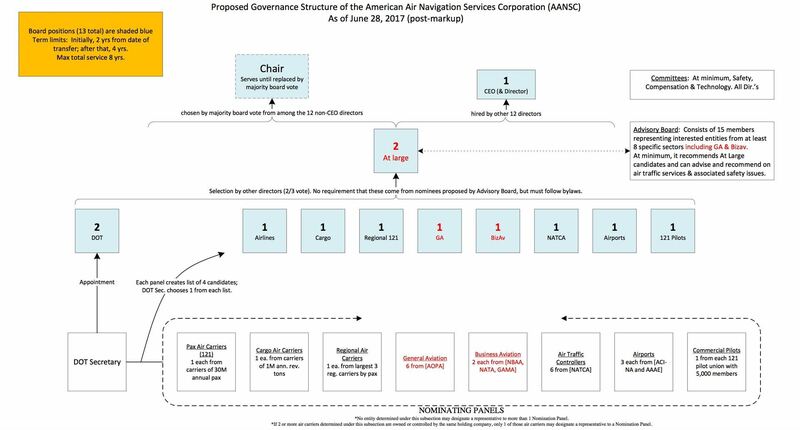 Information presented on a regular basis by general aviation user groups demonstrates the misgivings of creating a leadership committee that could be swayed heavily in the interest of airline operations while leaving the general aviation community without support services and access to the nation’s airspace and airport facilities. Those in favor of change have referenced implementation of Next Gen technology and efficiencies that are more cumbersome to achieve under government control. Users of the system trying to decide on the issue have struggled to find accurate and unbiased information on both sides of the issue. There is no doubt that new technologies move faster than the regulations that try to control their uses. As the airspace system use grows with new aircraft and UAS entering the mix, we need to look at better ways to become more agile and incorporate the new technologies into the system. If the current ATC system is an unviable platform for these new technologies, we should fix it with a unified approach, not a political debate. If there is a safe and innovative way to improve our system, ORBAA will gather that information and share it with our membership. Ultimately, decisions on how and when to support any legislation always boil down to individual and/or company circumstances. As such, we encourage you not to be unduly influenced by political rhetoric, but instead apply your own experience, knowledge, and inputs from your trusted professional colleagues to reach the best position for you and your company. In conclusion, ORBAA does not intend to take a lock-step approach for the support or opposition of this issue. There are aspects of the current legislation that present valid and desired changes, but we want to embrace a thoughtful approach based on facts that support the best interest of our members. We will continue to keep you informed as this legislation moves closer to a final vote. At any time that you wish to discuss your concerns or have questions regarding the legislation, the ORBAA Board will make every effort to assist you in finding answers to your questions. On behalf of the ORBAA Board, thank you for your time and commitment to our organization and industry. Myth: This bill will harm the general aviation (GA) community. Fact: The 21st Century AIRR Act legally prohibits the new air traffic control (ATC) service provider from charging user fees to any segment of GA. It statutorily prohibits this and it would take an act of Congress to charge GA user fees, so any suggestion that this is not the case is false. It also prohibits the new service provider from unilaterally restricting airspace or airport access in any way. GA operators will be guided through the national airspace operating under the same rules that apply today—with safety as the first priority. Further, GA will appoint two members to the board of directors, and will be represented on the Advisory Board. All of these protections provide more certainty to the GA community than they have today. Myth: The new air traffic control service provider will have no oversight. Fact: The new not-for-pro t ATC service provider will be subject to FAA, DOT, and congressional regulation and oversight. Currently, the federal government does not build, maintain, or y commercial airplanes, yet the FAA, DOT, and Congress provide robust oversight of manufacturers, pilots, mechanics, and airlines. The ATC service provider will be subject to equally rigorous oversight. Myth: This bill turns over the airspace to the airlines. Fact: Air traffic control is a service, plain and simple. It is a service that safely spaces planes moving from one airport to the next. The new ATC service provider will not determine airspace access, and it will not own the airspace. The airspace will remain the sovereign domain of the United States. The FAA will remain the regulator of the airspace. Myth: DOD will be adversely impacted by this proposal. Fact: Nothing in the 21st Century AIRR Act will harm national security or the operations of the DOD. The new corporation will support all United States government flight activities currently supported by the FAA. The new corporation will not charge the DOD a user fee for the service. Also, the bill retains and clarifies the President’s authority to temporarily transfer the ATC service to the Secretary of Defense in times of war. Myth: This is just another Consumer Financial Protec on Bureau (CFPB). Fact: The CFPB is a government regulatory agency funded on the mandatory side of the federal ledger. The new corporation created by the 21st Century AIRR Act is fully independent from the government. It will not be funded with federal dollars, mandatory or otherwise. Again, it will have no backing from the federal government. Further, the new corporation will have no regulatory authority. Rather, the ATC service provider will be a private business, providing a high-tech service, and regulated by the federal government. Myth: Separating air traffic control will not accelerate modernization. Fact: ATC modernization could hardly be worse or slower than it is in FAA’s hands. Case in point, the FAA is installing technology known as the Standard Terminal Automation Replacement System (STARS). The trouble is that they started installing it in 1996. Even worse, STARS is the salvage from an FAA program that started in 1983 and was killed off in 1994. In that instance, the computers and software, which cost $1.5 billion, had to be thrown away. One participant described this program as the “greatest failure in the history of organized work.” This example is not unique in the FAA’s sordid history. Myth: Having the aviation on safety regulator oversee itself as the ATC service provider is preferable to arms-length regulation. 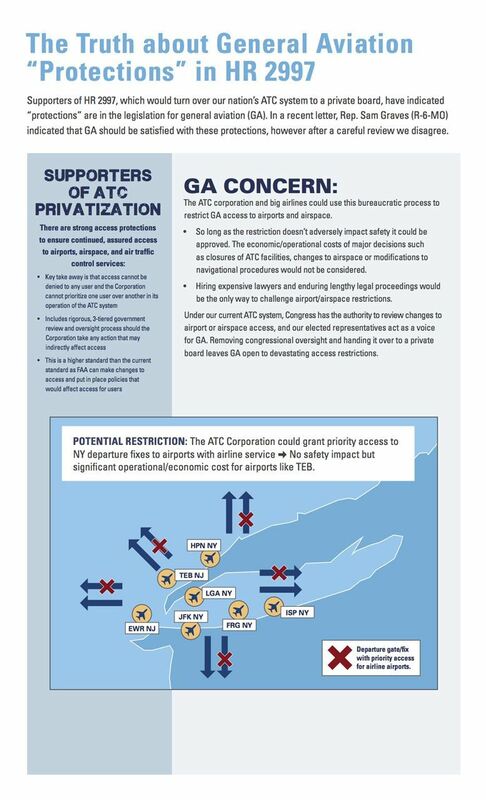 Fact: Of all the arguments against separating ATC from government, this is perhaps the most absurd. Every other part of the aviation industry is subject to disinterested FAA safety regulation, oversight, and enforcement. By their logic, opponents of reform must also believe that FAA should quit overseeing airline safety and let airlines do it themselves “since direct communication creates more efficient work. . .under one roof” as some, such as deeply entrenched FAA middle-managers and bureaucrats, have suggested. 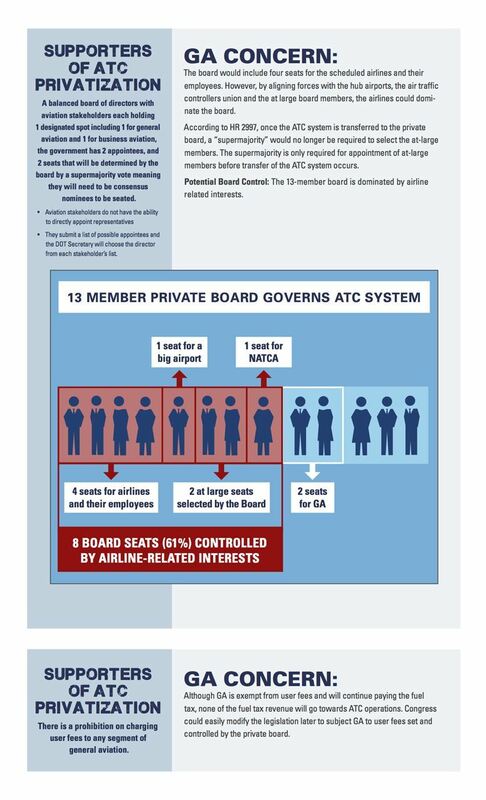 There is no clearer conflict of interest in our system of aviation safety than FAA’s operation of air traffic control. Myth: American airspace is too busy and too complex to replicate the success of other countries. Fact: The United States has long been the global leader in aviation. We achieved this status through bold ideas, ingenuity, and hard work. In 1987, separating ATC from the government was a bold idea. Thirty years later it has become a common-sense, good government practice that has consistently and repeatedly delivered gains around the world. As the largest and most sophisticated aviation system, the United States has the most to gain in terms of efficiencies and the most to save by getting bureaucrats out of the technology business where government has consistently failed. This oft-repeated argument shows that certain opponents of ATC reform are willing to sacrifice American leadership to protect narrow parochial interests. Myth: The bill gives away FAA assets to the independent air traffic service provider. Fact: Air traffic control assets do not belong to the FAA. These assets have already been paid for by the American taxpayers and consumers. If the new not-for-profit service provider is charged for the transfer of these assets, that means the traveling public will end up being charged again for something they have already paid for. Furthermore, many of these assets are old, outdated equipment and facilities that have exceeded their useful lives and must be replaced anyway. According to the DOT IG, 59% of FAA facilities are over 30 years old. Myth: Taking air traffic control service out of the federal government will harm safety. Fact: The bill prioritizes the continued safety of our system. In fact, the FAA will be able to increase its focus on its vital safety mission. Numerous studies have shown that ATC reform results in improved or steady levels of safety, in addition to other bene ts in efficiency, cost, and modernization. Independent ATC service is now the international standard, recommended by the International Civil Aviation Organization (ICAO), and has been adopted by more than 60 other nations.